I recently started on a new team at work, and have been much happier as a result. I am now on a smaller team with fewer political headaches, and instead of working five different shifts over six weeks I now do the same shift all the time. The only downside to this has recently come to light (or should I say darkness? ): I start work before sunrise and as I finish the sun is starting to set. I therefore don't really see any daylight during the week at the moment and I feel that I am starting to get the "winter blues". I realised half way through the week that there must be a reason for how tired and low I was feeling, and, never one to sit around moping when there is a simple cure, prescribed myself some outdoor activity for the weekend. I have never been one to willingly go for a walk unless it is for a specific purpose, like for exploratory purposes or to walk the dog. I had a prescription to fill, however, so I hooked my phone up to some podcasts (Scott Mills Daily, if you're interested) and found a path along the canal that stretches out of my town in the Cambridgeshire Fens. If you've never heard of the Fens (I certainly hadn't until I moved here), they are a large area of very flat agricultural land that is below sea level and was once swamp land. The swamp was drained and irrigated, leaving fertile soil behind that is perfect for arable farming. Due to some failed drainage attempts, in some areas the water level in the canal is actually higher than the land around it (held back by high banks). When I first moved here, I loved how you could see for miles in every direction because of how flat the land was. Of course, for the most part, all you can see is farm land and the wildlife making use of the canal. People talk about the "big sky" that is unobstructed by hills or mountains (or trees), and on a sunny day it really makes the scenery all the more spectacular. All this definitely helped my mood, and I am now ready for another five days of darkness. I baked these muffins to use up some impulse-bought fruit, and soothe my premature craving for all things Christmas. I used dark muscovado sugar and purposefully left some of the lumps in it (it can be very dense) because I like the pockets of toffee flavour that result in the muffins. I put cranberries in half the batch, and apples in the other half. If you a full batch of one type, just double the amount of fruit listed below. P.S. Don't freak out about the mayonnaise. Just trust me. The recipe was loosely based on the recipe for Pear & Ginger Muffins from Nigella Express by Nigella Lawson. Preheat the oven to 200C/180C fan. Line a cupcake/muffin tin with twelve muffin cases. Place the flour, sugar, baking powder and cinnamon in a mixing bowl. Mix well, mashing the sugar a bit to break it up so that only a few small lumps are left. In a jug, combine the eggs, mayonnaise, soured cream and milk. Stir until smooth. Make a well in the flour mixture and pour the liquid from the jug into the middle. Divide half of the batter between the muffin cases. Sprinkle the chopped apple into half of the muffin cases, and cranberries into the other half. 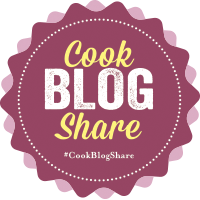 I'm entering this into Supergolden Bakes' weekly Cook Blog Share round up. I can't imagine this is an easy thing to keep up, especially with Lucy's busy schedule, so head over to take a look and support her. I'm also adding this to Jen at Blue Kitchen Bakes' Fresh Cranberry Recipe Linky. Haha even if I hadn't discovered how useful mayonnaise can be in baking I would have trusted you on these! They sound delicious. I really need to start using cranberries more. Thanks, that's nice of you to say! Yeah I feel the same about cranberries; this is the first time I've used fresh ones in a long time. I enjoy muffins, more than I do cupcakes and these are so seasonal. Again, intrigued by the mayo in this. Try it, you'd never guess it was there!